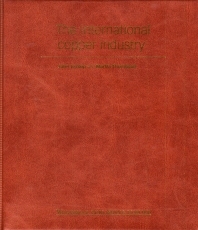 Written by two leading experts in the copper industry, the late John Jessop and Martin Thompson, formerly of RTZ, this addition to our major series of looseleaf guides to the key international metals industries is required reading for all those new to or needing a strategic analysis of the international copper marketplace. History and background; Origins and location of copper; Exploration, mining and refining of copper; Fabrication of copper and its alloys; Main types of copper and its alloys; Qualities of copper and its alloys; End-uses of copper and its alloys; Structure of the market; International trade in copper; Appendices. John Jessop was a highly respected and well known figure throughout a 40 year career in the metals market, who sadly died before completing this handbook. He first specialised in copper as a buyer for British Kynoch Metals (a subsidiary of ICI) where he began daily attendance on the floor of the LME. He then worked as Manager of Lead and Zinc at Entores Ltd and was Director of its subsidiaries, Entores Metal Brokers and S F Jones Ltd. John Jessop was a member of the LME panel of arbitrators for 15 years, and was particularly knowledgeable on the workings of the LME and the way it is used by miners, fabricators, merchants and investors. He lectured on the metals market as a representative of the LME and for 20 years wrote and edited weekly reports for Entores and Ametalco. Martin Thompson retired as Commercial Adviser for Rio Tinto plc in 1999, having joined the company in 1968. From 1976 onwards he dealt mainly with base metals, specialising in copper. He is a regular writer on the metal and has undertaken an examination of an international trade dispute on behalf of GATT. He was Chairman of the British Copper Development Association, Vice-Chairman of the European Copper Institute, and Chairman of the Statistical Committee of the International Copper Study Group. Previously he worked for Consolidated Tin Smelters Ltd and for the merchant bank NM Rothschild and Sons, in London and Rhodesia. Martin Thompson is also editor of the Base metals handbook (Woodhead Publishing, 2001).